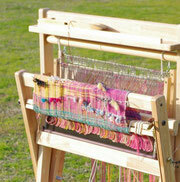 For everyone SAORI looms functionality and ease to operate can bring freedom, creativity and fun into hand weaving! New !! SAORI Wooden Loom "Kasasagi" Series ! Made from eco-friendly, glue laminated recycled timber. 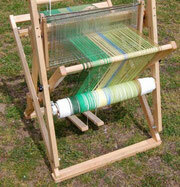 Point 1 : Fold-able loom made from wood. It is made from glue laminated timber of rubber tree. It is smooth to touch and attractive in appearance. Point 2 : Easier to operate. 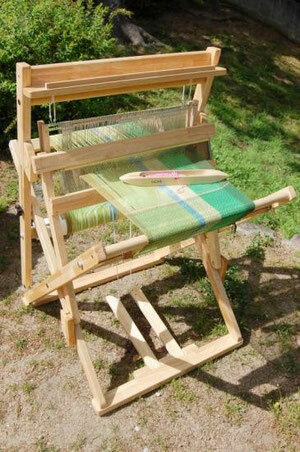 It is very simple to wind the cloth roller. Point 3 : It has border for the tray. You can put bobbins, shuttles, scissors etc on the tray without them easily falling off. Point 4 : You can put the thread down through the dents in the reed smoothly. 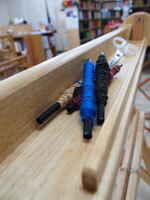 The beater can be fixed on the loom, so it becomes easier to thread the reed. Point 5 : The warp is easier to wind. The position of warp roller is higher than the previous models, so it becomes easier to wind the warp. Point 6 : The SAORI 55GX Kasasagi is compatible with the SAORI 52 and SAORI 60 series. You can use whichever tying cloth and tying rod. You can use the reed and heddles from the previous model, SAORI 52 and SAORI 60 series on the SAORI 55GX Kasasagi. Point 7 : It has two stoppers to prevent the warp slipping down. 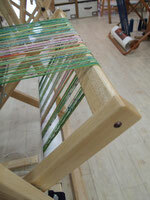 There are stoppers on the edge of the back beam, so you do not need to worry about the warp slipping down. The winder and boat shuttle are not included. Basic model without *accessories available. ※The color of the wood of the looms may vary from image above.